When you have a tractor, it is imperative that you learn how to change and how to fix a flat tractor tire. This is a valuable skill since it will save you both money and time from hiring a service truck whenever you need help with your tractor tires. Doing this task may seem daunting at first, especially with the thought of having to do it alone. But by following this list of guidelines on safety and quality, changing a tractor tire on your own is certainly a doable task. Changing a tractor tire should never jeopardize your safety. Read your manuals and familiarize yourself with the instructions and warnings stated there. Before you begin, make sure you have the appropriate gear for changing tires, especially those that protect your eyes and hands. Lay your tools properly where you can safely reach them. If you have neither tools nor the safety gears for this task, it might be best to call for professional help instead and observe how he does it. Learning the skill is not merely enough, of course. Taking careful notes on how you can make the whole process safe is an equally important skill. Before starting work on your tractor tires, you have to make sure to stabilize it enough for the procedure. You can do this by checking that the tractor is parked on a solid level surface. You should then block its front and rear wheels with bricks. You can now raise the tractor using a heavy-duty jack and support it with a jack stand. You have to make extra sure that the tractor does not roll forward and backward or swing from side to side. 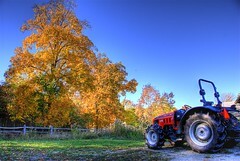 A properly stabilized tractor will make changing its tires easier and, most importantly, safer. An important lesson to learn on how to change a tractor tire is to know how to remove a tire bead. If your tractor tire’s rim is designed so that the valve stem is outside, the rim should be positioned with the valve stem on top. Afterwards, you’ll have to deflate the tire and insert a bead breaker tool into it. Remove the valve core to deflate the tire, and loosen a six-inch wide area in it by thrusting an iron between the bead and the lip of the rim. You can then insert the bead breaker tool and lock it to the tire rim. You can use the same procedure for breaking the inside bead. When the outside bead has been pried completely over the rim, you can then remove the tube. Pull the tube outward starting at the bottom, working up on either side of the tire until the tube has been completely pulled out. Use a tire spoon to loosen a tube that has become stuck. When both beads have been removed, you can then lubricate both the tire bead and the bead seat area. Use only those lubricants that have been approved by experts, or a mild vegetable oil soap as substitute. Any other product may have chemicals that can damage your tire. You can remove the tire using two tire irons. Do this process slowly starting at the bottom pulling outwards. Pry small portions of the tire at a time, otherwise you might end up damaging it. After removing the tire, you must get down to cleaning the rim, checking it for damage, and eventually pampering it with a coat of rust preventative to keep it in perfect working order. Use an approved mounting lubricant for lubricating the inside bead of the new tire you are about to install. When installing, make sure that the valve stem is at the bottom. Get your tire irons and work on pushing the inside bead the rim. The tube should be installed next, making sure to insert the valve through the valve hole. Before installing the outside bead, lubricate it first and do the same procedure to insert it as with the inside bead. As a final step on how to change a tractor tire, make sure that the beads and the tire rims are properly aligned. You can then inflate the tire slowly until the beads are seated. Afterwards, deflate and/or re-inflate tube as per manufacturer’s instructions.